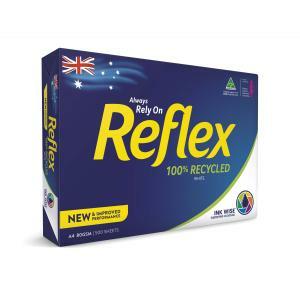 Reflex 100% Recycled White in A4 size is a high-quality recycled paper that achieves excellent whiteness. It now features Ink Wise™ delivering a new standard in its print and paper performance. With Ink Wise™, Reflex paper now delivers sharper, more vibrant prints with absolutely no extra ink, toner or effort. It's also smoother and whiter than ever before. Please order 5 for a box.